This posting is part 2 of my account of the setting up of the Camden cycle tracks at the turn of the century. Part 1 outlined the background to the gaining of political support for project from the point of view of one of those who campaigned for the cycle routes. Here I want to emphasise that this was a ‘team effort’ and several members of Camden Cycling Campaign attended endless committee meetings and site visits over a prolonged period. Without that commitment the project would not have succeeded. This posting gives some details of the two cycle tracks, a couple of other projects related to my time in Camden and, finally, a few words about more recent developments. The ‘Seven Stations Link’ was first proposed to Camden council at the beginning of 1998. This paragraphs that follow are based on extracts from the original documents proposing the route, dated January 1998 and September 1998. The first proposal was for a substantial network linking Paddington and intervening railway stations (Marylebone, Euston, St Pancras, Kings Cross, Thameslink) with Liverpool Street, thus getting the name of the ‘Seven Stations Link’. The connection with the rail stations was not the primary purpose of the network, but it pointed to the broader outlook, linking it with an ‘integrated transport vision’. The primary objective of the proposed cycle route was to provide a high-quality ‘backbone’ network that could be used as a ‘distributor’ link to locations in Central London, given that the route ran from north-west Central London to east Central London. The emphasis was put on a continuous route that tackled all problems, especially at junctions. However, the full Seven Stations Link stepped well beyond the boundaries of the borough of Camden. Neighbouring Westminster and Islington boroughs were not interested in cycling schemes, so the proposal became confined to suggesting to Camden council build its section of the link, running east-west across the borough. We also proposed a ‘feeder’ link on Royal College Street (part of the ‘Somers Town’ cycle route) running parallel to the heavily congested Camden High Street. “The proposal is for a dedicated bicycle network in North Central London with a ‘backbone’ route and ‘feeder’ routes serving seven major rail stations, residential areas of ‘Inner London’ as well as routes in ‘Central London’. The proposal addresses the question of how in increase cycling as a mode of transport in Inner and Central London. 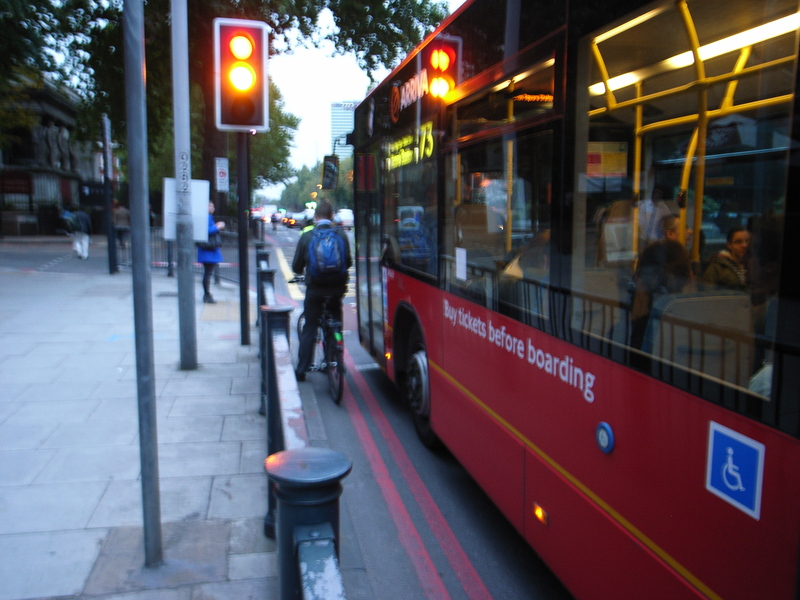 In terms of distance and topography London is an ideal city for cycling, however, the main retarding factor is the conditions faced by cyclists on the road. The backbone is intended as a catalyst for wider bicycle route provision in London. It must have its own growing network of feeder and links to other network routes in London. It is also intended as a ‘showpiece’ development setting the trend for the imaginative and effective measures that will be needed to ensure a significant increase in cycle use in London. The proposal is for a network that encourages cycling by ensuring widespread network reach and an implementation that makes cyclists feel safe. The actual and perceived dangers of cycling are the main reasons why people are reluctant to take up or continue cycling. 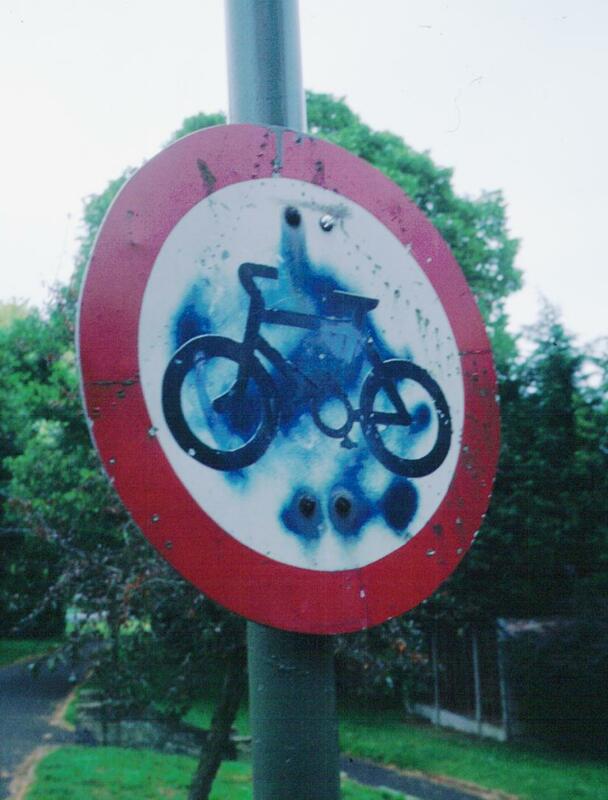 This implies that a dedicated or ‘segregated’ network is needed if cycling is to be stimulated. Implementation of such a network would be a clear statement from the authorities in London that cycling does have a significant role to play by according it its own space. 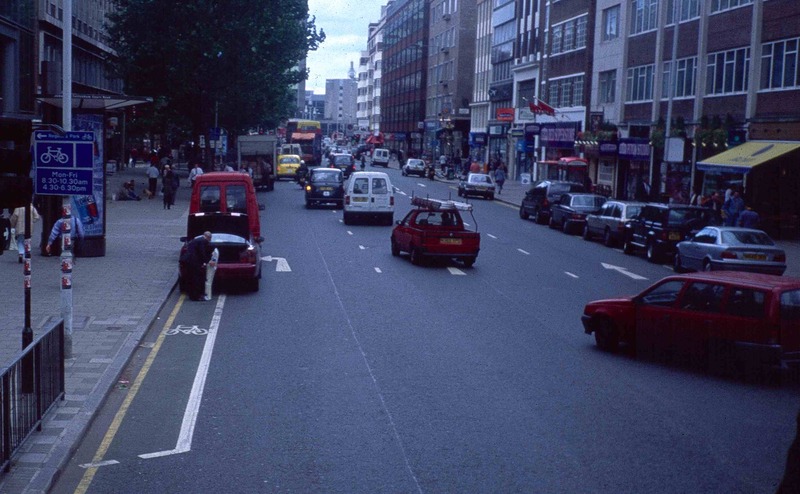 I first presented the idea for a two-way segregated track in the ‘Bloomsbury’ district in 1997 to a meeting of the Camden Cycling Campaign in a upstairs room of a pub on Chalk Farm Road on a hot summer’s evening. It received immediate and enthusiastic support from members and was adopted for policy presentation to the council. It would be tedious to go through all the meetings and lobbying that went on, but it is essential to say that the council, at the suggestion of Councillor Gerry Harrison, set up a liaison committee for cyclists, pedestrians and residents to talk to the council about environmental and street improvements. This liaison committee backed the cycle route proposal, thus giving it wider community support outside the cycling lobby. This channel of communication was critical to the success of the project. 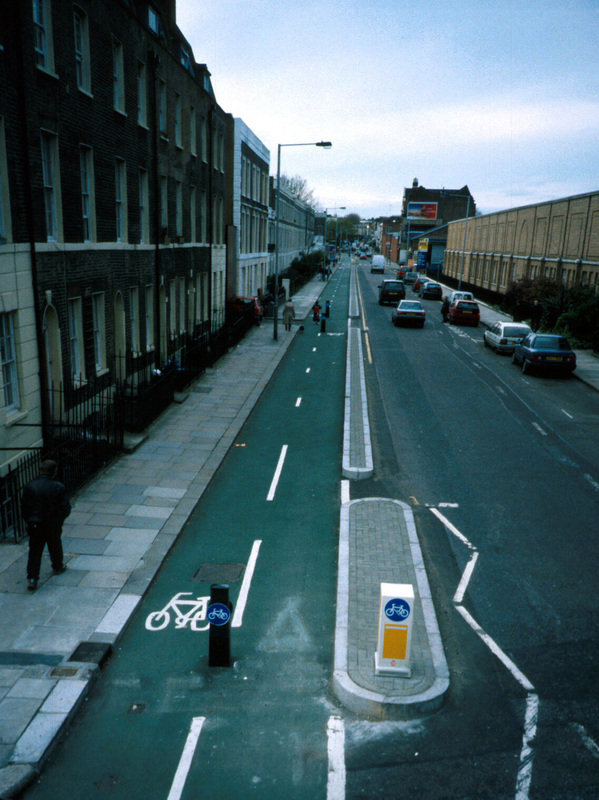 There was another important feature throughout the campaign for these cycle tracks – ‘ordinary’ people, who never imagined that they could conceive of themselves cycling on London’s streets, recognised that this style of cycle track could attract them onto the saddle, thus we received very wide support. This gave the councillors who backed the project further faith and encouragement. 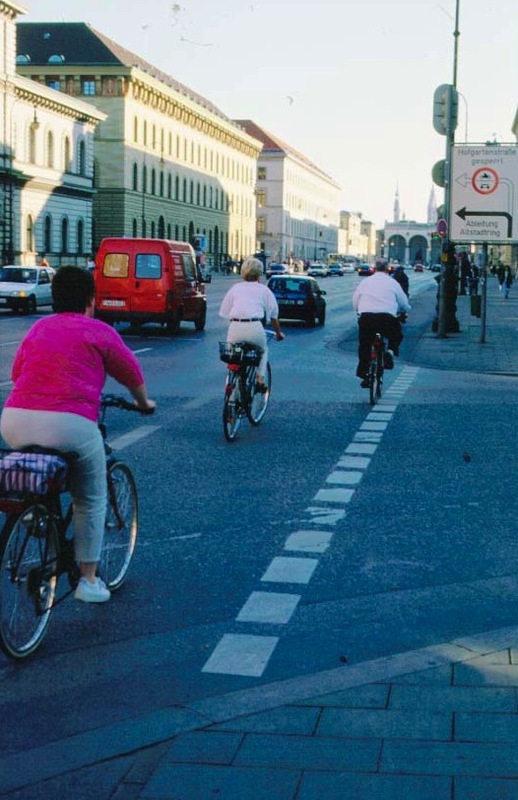 Building alliances and gaining support in the wider world has long proved a tough challenge for the inward-looking cycling lobby, but with this plan this was not a problem because people could see that this was a practical and realistic way of getting more cyclists. The most effective opposition to the proposal within the council came from a few Labour councillors who were firmly set against doing anything to promote cycling and indeed, in one or two cases, actively wanted to impede progress and see less cycling on London’s streets. One councillor in particular argued that increasing cycling would reduce demand, and thus fare revenues, for public transport. As this councillor lived in Central London, he didn’t need to use the tube or buses in rush hours and thus did not understand how awful it is to be crushed into the overcrowded tube. Nor did he appreciate that cycling could reduce overcrowding pressures on the tube system – there are frequently so many people wanting to use to get into main tube stations during rush hours that they have to queue outside and wait for access to the overcrowded platforms. The most effective public transport improvement that could be made in London would be to provide effective cycle routes. 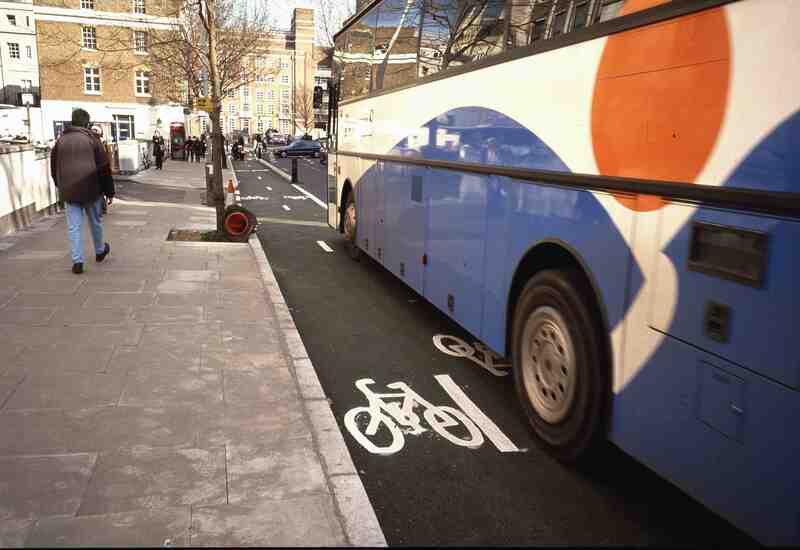 The council had justified restricting the hours of operation of the ‘Bloomsbury’ LCN painted cycle lanes by arguing that they were ‘necessary’ for servicing businesses. We argued that, this in effect meant that there could never be any full time cycle lanes in Central London and in many other parts of Inner London. 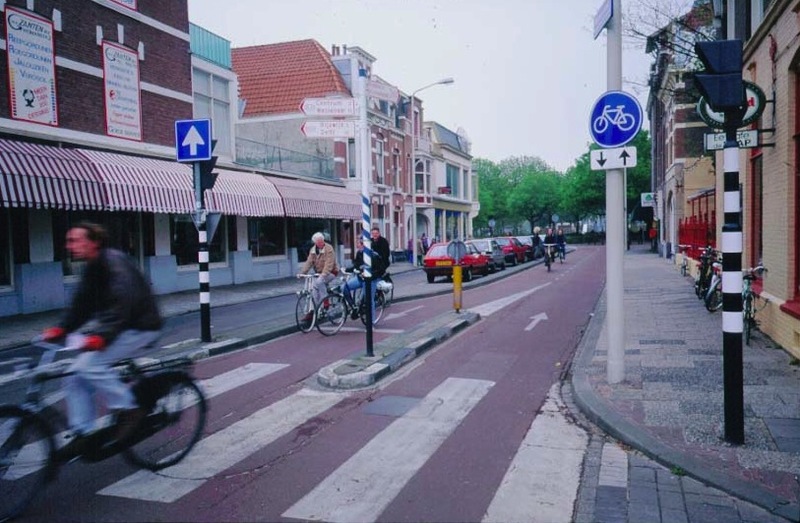 Physical segregation, however, allows the continued servicing of businesses – without disrupting the cycle track. 5 – provides uninterrupted facilities for ‘servicing’ businesses for deliveries, for residential user parking, bus stops etc. The proposal for the main backbone cycle track, the Seven Stations Link, was accompanied by a suggestion for a cycle track along Royal College Street, forming a ‘feeder’ link between commuters’ homes in Camden and beyond and their work or study places in Inner London. 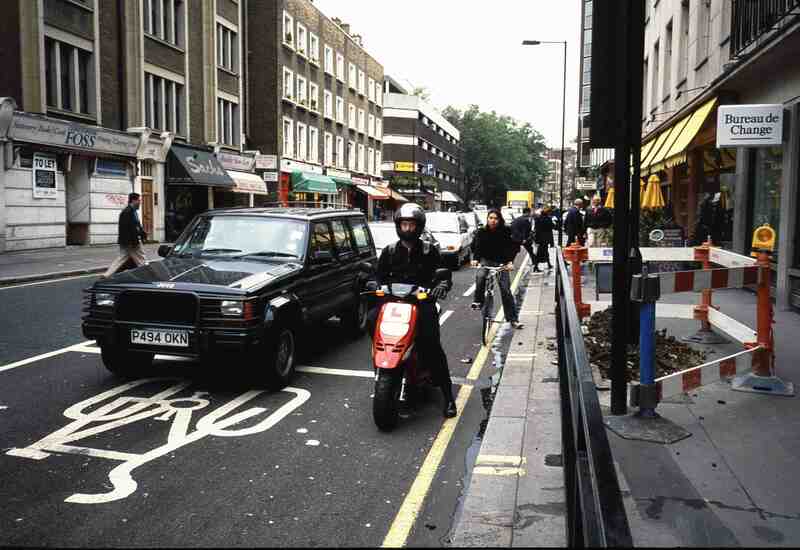 Royal College Street is part of the one-way ‘gyratory’ system that dominates the roads of the whole of Camden Town. Royal College Street itself was one-way northbound and made no allowance for cycling except for two short sections (each approximately 20 metes long) of cycle track near the northern and southern ends of the road. These short sections of cycle track were part of the ‘Somers Town’ cycle route introduced by the Greater London Council in the 1970s. On the main section of Royal College Street, however, the cycle route was diverted to twist and turn down back streets. Southbound access to the cycle route involved cycling down a parallel one-way road, also part of the gyratory system, St. Pancras Way. The Camden Cycling Campaign proposal was for a two-way cycle track to run on the left side the road (facing north) linking up the two short sections of existing cycle track at either end. 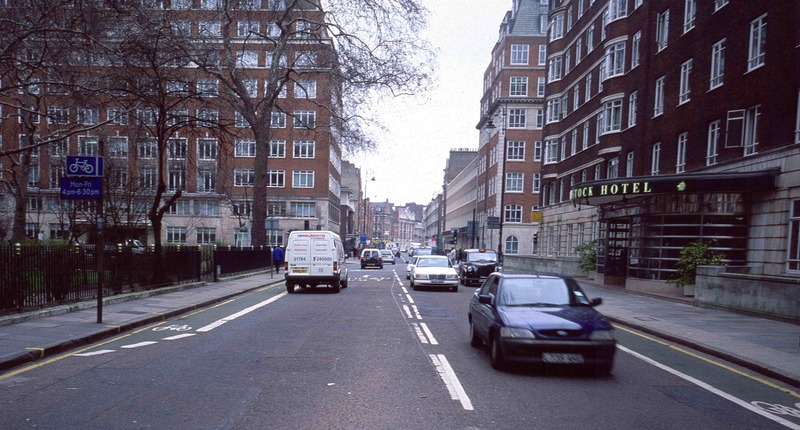 As Royal College Street was a long straight and wide road with plenty of room for parking on both sides, as well as two lanes of motor traffic, the plan was so obvious that it gained momentum very quickly and was implemented before the Seven Stations Link. Implementation was not without problems. 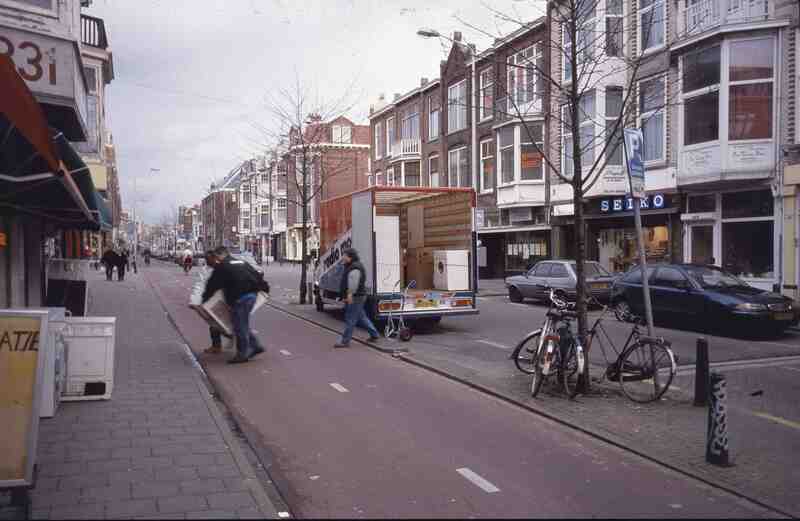 The council’s first effort was ridiculously narrow – too narrow even for a one-way cycle track, let alone a two-way system. 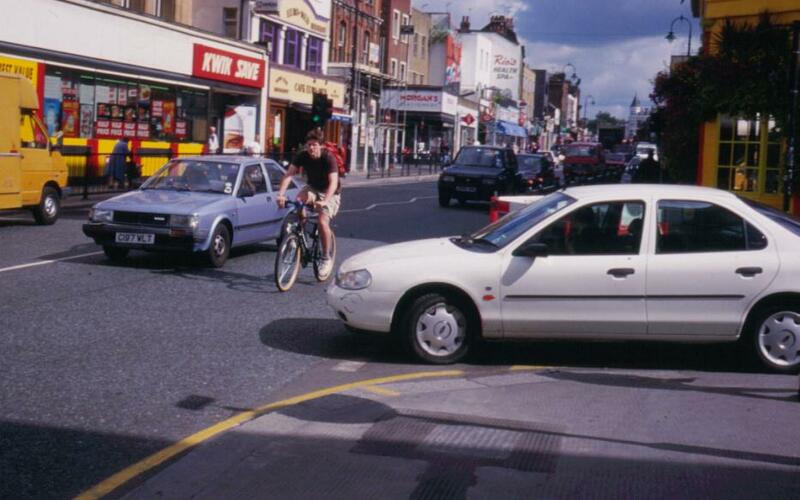 Also the traffic planners wanted to insert ‘cyclists give way’ signs at every junction. We argued fiercely for a wider track and for retaining cyclist priority at junctions. With backing from Councillor Gerry Harrison we were able to get these principles established (the original ‘give way’ signs are visible in the photo below). 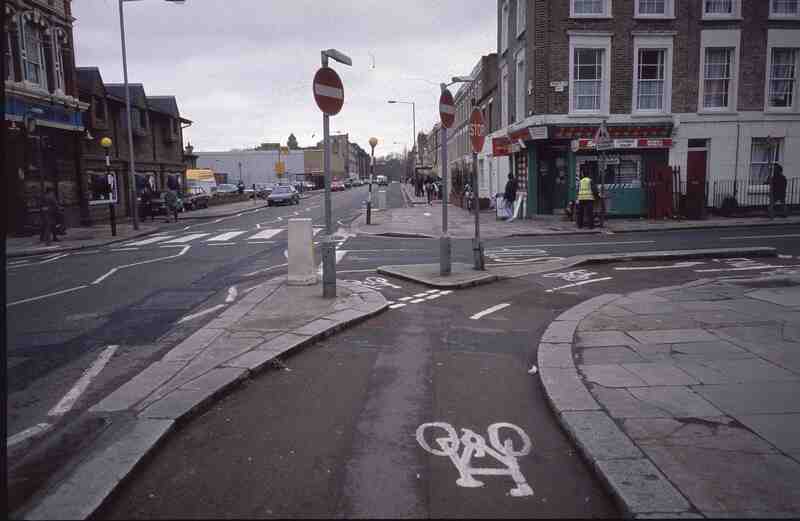 The idea of giving cyclists priority at junctions is fairly unusual in Britain and the Camden tracks are among some of the very few examples of cyclist priority on cycle tracks in the country (which is standard on continental European cycle tracks). However, we expended a lot of our ‘political capital’ on these battles, thus we were forced to compromise on other issues. In particular, we lost the battle to get one fast ‘rat-route’ through a housing estate to be closed and for through motor traffic to be diverted on the main roads. Also the design at junctions and on St. Pancras Way was severely inadequate. The photo below show the newly implemented two-way cycle route running along Royal College Street. It was an immediate success, with a threefold increase in the number of cyclists using the route (according to surveys organised by the government’s ‘Transport Research Laboratory’, TRL). It is most unlikely that this immediate increase in cycling numbers represented an influx of new cyclists, but rather that existing cyclists switched from other routes to the new cycle track. This idea is given added weight by TRL findings that a significant number of the users of the new route cited the track as their main reason for using that route. Since then user numbers have grown so the track has successfully attracted both existing and new cyclists. Unfortunately, the level of attention to detail in design was not adequate and there are a few problems at a couple of junctions. The old habit of doing as little as possible dogged the design process – see the last two photos on this page for an example of lazy design work. In the past couple of years Camden has undertaken the expansion of the track and there are now two one-way cycle tracks on different sides of the road. While this development is highly encouraging, there has been some controversy over the council’s decision to remove the segregating kerbs and replace them with ‘planters’ and ‘armadillos’, to create a look of ‘segregation lite’. 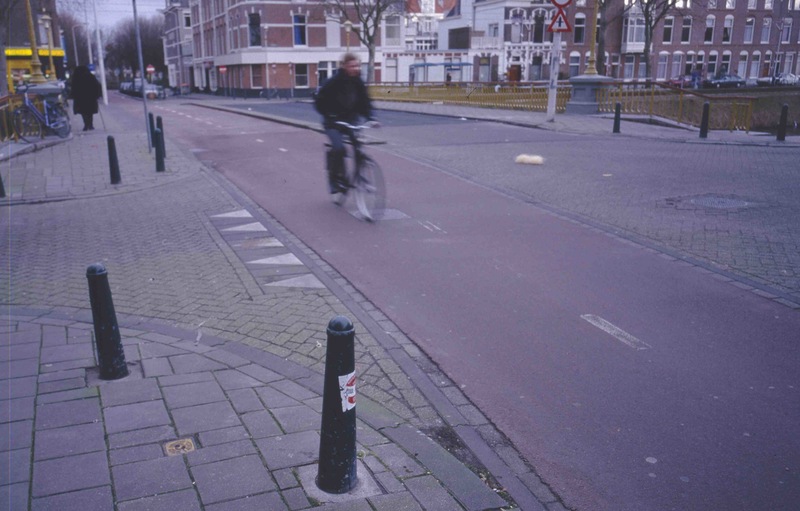 Such techniques could allow the implementation of protected cycle routes much more cheaply than using more expensive kerbs. However, continual damage to the planters and armadillos from motors has to be monitored to see if they offer ‘segregation effective’ – which is the primary aim and which should not be compromised. 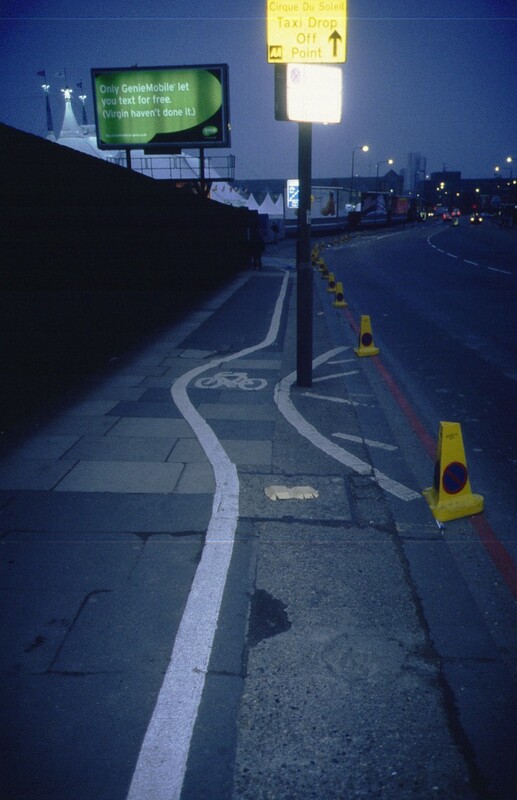 The painted London Cycle Network route through Bloomsbury was introduced in 1997 using painted lanes – which were ‘operational’ only during rush hours. There was immense dissatisfaction among Camden Cyclist Campaign members with the pointless painted cycle lanes as they made absolutely no difference whatsoever to cycling conditions. The Seven Stations route would have involved several boroughs, including Westminster, Islington and the City of London Corporation, as well as Camden. As Camden alone took up the idea, we dropped the Seven Stations Link name and the Camden section of the route is now sometimes known as the Bloomsbury cycle route (or as LCN route 0). The photos on this page illustrate the Bloomsbury track after implementation. It forms the basis of a key part of the present day cycle network in London – and is the most popular cycle route in central London, earning great praise from cyclists. There are serious design failings in the route, but it has demonstrated beyond doubt that segregated tracks are immensely popular. Use has increased steadily since the track was first introduced and several hundred cyclists use it during the morning rush hour. 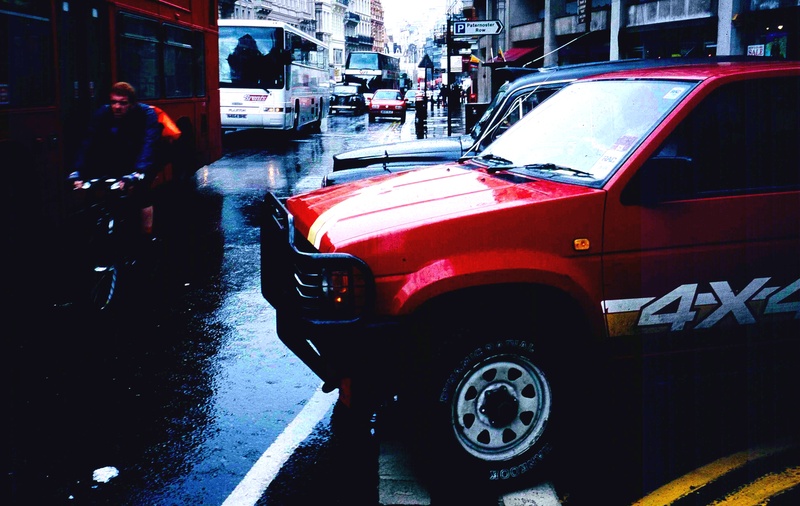 The opportunity was also taken to introduce significant changes to one part of the route, Byng Place, where traffic calming and pedestrian crossings were introduced. This transformed Byng Place from a fast, wide mass of tarmac into a much more calm place with motor vehicles driven quite slowly thanks to the pedestrian crossings and traffic tables. Regrettably the Byng Place section of the segregated cycle route was removed when, for a period, Camden was run by a Conservative/LibDem coalition on ‘aesthetic’ grounds, reintroducing aggressive driving through the place. We also campaigned for pedestrian facilities to be improved all along the route, such as re-working junctions so that pedestrian priority was enforced by raised tables for motors to cross the pavement, but this idea was rejected by Camden council. It is, however, a key feature which cycle campaigners should lobby for when introducing cycleways. 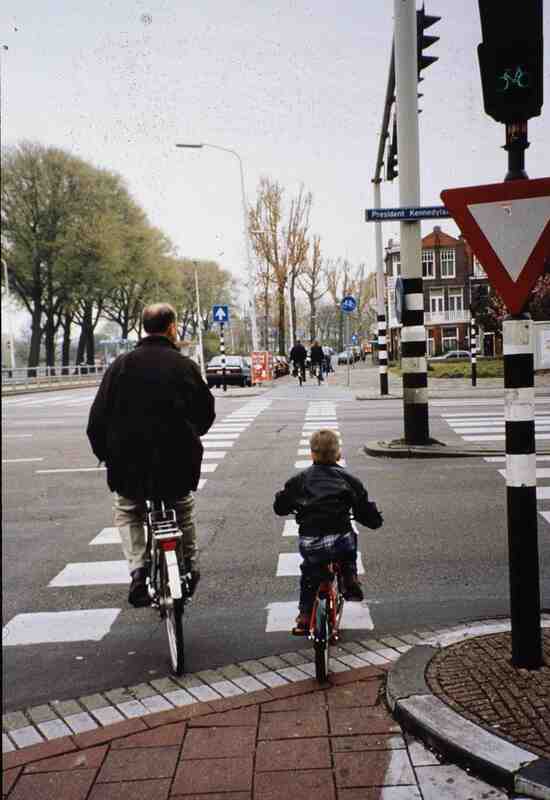 Not only is it vital in London for something to be done to improve pedestrian crossing at junctions, but it also strengthens the cycling/pedestrian case and there is much that unites us in looking for changes in the priority given to different transports modes in our cities, towns and villages. 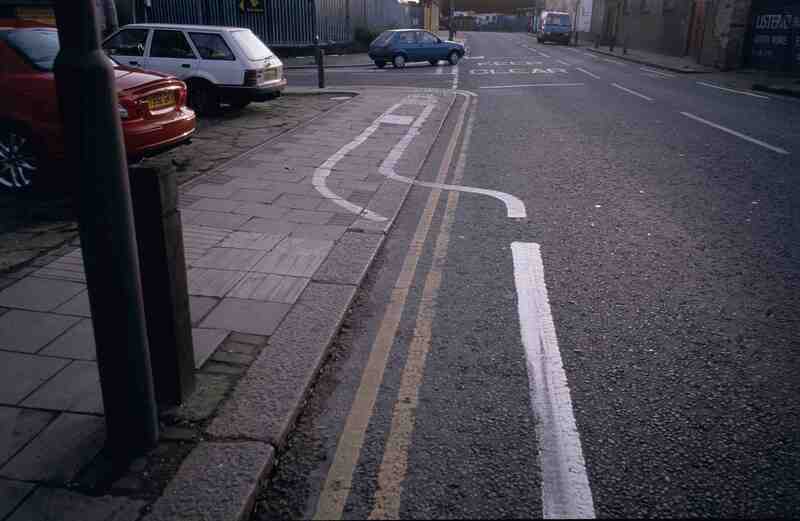 As with Royal College Street, there were vigorous debates between us and the council’s designers over numerous points. 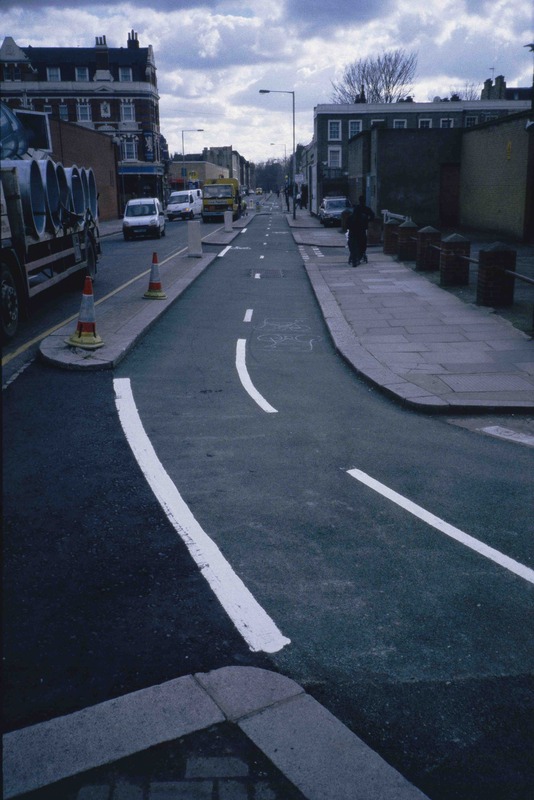 The initial implementation used a painted line on the approach to the junction with Gower St. We managed to get this changed (and also another ridiculous design for the junction with Tottenham Court Road), but these successes lost us political credit for other issues. 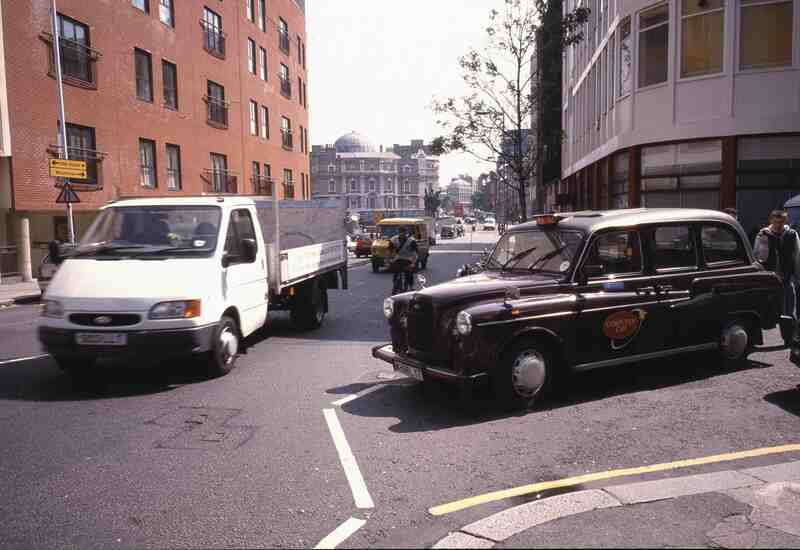 Problems have arisen where the original design standards were compromised, most notably at the junction with Gordon Square where there are lots of black cabs heading to and from Euston station, crossing the track, using a junction without any traffic lights. A simple diversion of this traffic onto a signalled junction and a parallel route would solve this problem. This was part of our original proposal. When the first phase of the Bloomsbury track was put out to local consultation it received considerable support from local residents and businesses alike. The tracks have also proved immensely popular with cyclists and the number of cyclists using the track has risen steadily. 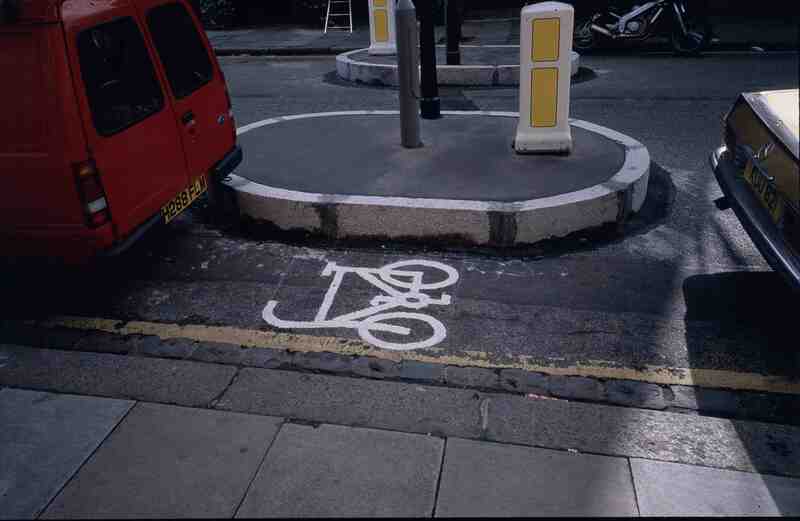 However, the anti-cycling lobby was soon stirred into action. After the first phase of the route was introduced covering the eastern side of the borough discussions took place over the route to reach the eastern boundary of the borough. This was highly controversial and the local MP, Frank Dobson, played a significant role in preventing the use of the most suitable route. This involved passing Coram’s Field playground. Mr Dobson went as far as threatening to lie down in front of the bulldozers (though of course such bulldozers were a figment of his self-indulgent imagination). He argued that it would be dangerous for children to have to use a playground near a cycle route. Obviously, in Mr Dobson’s understanding of the world, it is safer to have speeding motor vehicles alongside the pavement than slower moving cyclists. It also seems he lacks the capacity to imagine that inner-city children would benefit enormously from being able to cycle to and from the playground safely. Instead he exerted undue influence on Camden Labour Party to use a sub-optimal route – and to keep the children penned in by fast-moving motors. There was also opposition from the cycling lobby’s core activists. This derives from the view adopted by the Cyclists Touring Club (CTC) way back in the 1930s, when it decided that it was against cycle tracks. This attitude has been passed down the generations and it is necessary to subscribe to this view for anyone hoping to become a core activist. However, it is an attitude confined to a small number of activists. When the London Cycling Campaign recently (2011) conducted a membership consultation the members’ choice was to support a campaign for London to ‘Go Dutch’. Also, it is noticeable that CS3, which has a long segregated stretch, does better in just about every aspect of the study: a high proportion of people use it because it ‘feels safer’ or is ‘more pleasant’, more people say it improves reliability and journey time predictability, it also scores higher on most route quality indicators and it has a lower maintenance cost (see ‘Updates from CCC’ page). Meanwhile, cyclist death and serious injury rates are on the rise. Even the national press and TV has picked up on the terrible toll of cyclists’ lives on London’s manic streets. The two most important recent developments, however, have been overwhelmingly positive. First, there has been an upsurge in activity by people wanting proper space to be made available for people to cycle in London. Imaginative actions like ‘die-ins’ outside TfL’s headquarters and ‘flash-rides’ at junctions where fatal collisions have taken place have combined with effective organization through the combined use of ‘social media’ and traditional methods of campaigning. London Cycling Campaign’s upper echelon was devoting its attention to the critical issue of whether the organisation should change its name to London Cyclists or similar just when this upsurge of activity was happening and almost got left behind, though fortunately it was saved by the membership who had joined to campaign for better cycling facilities, not for a better name for the campaign. The vibrancy of the new campaigning means that the cycling lobby, for the first time in decades, is setting the agenda. The second reason for optimism is the proposals for east-west and north-south backbone network links for bicycles from the current mayor of London. If these routes are implemented as projected, then they will fit the concept we proposed in Camden 15 years ago for ‘rolling out’ a network of backbone links in London. These proposals will meet with immense opposition – the Corporation of London (which controls the City of London) is raising obstacles as is Canary Wharf Group (another private organisation carrying out governmental duties in the Docklands area). Within TfL opinion seems to be against the proposals, but they must follow the political lead and are rather reeling from the powerful ‘die-ins’ outside their headquarters and other actions such as ‘flashrides’ at junctions where TfL has been reluctant to do anything to deal with designs that lead to fatal, for cyclists, collisions, such as at Kings Cross. Also a lot of employers and businesses in the private and public sector have voiced support for the proposals, whereas the opposition had mainly come from lobbying bodies citing anonymous companies. And a recent opinion poll showed 63% of Londoners supported proposals. Whatever happens to these proposals in the immediate future, the idea that London should have high-quality cycle network links is now firmly on the agenda and it is clear that sooner or later these proposals will get the go ahead. Then a much bigger and more bitter battle will start – to ensure sufficiently high-quality of design, continuity and implementation. Boroughs such as Westminster and Kensington will no doubt do their best to nullify the routes that touch on their fiefdoms. But at long last the opening battle – to get the idea of high-quality cycle networks on to the agenda – has been won. The new cycling lobby faces two challenges in addition to ensuring approval of the cycleway proposals: first, planning now to deal with the battle for quality of design and implementation; and second, thinking now about how to expand the network as quickly as possible as successful implementation of the cycleways will only increase demand from people to cycle. 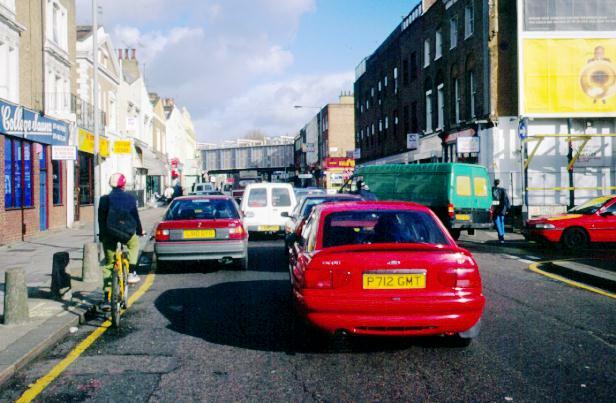 In the 1990s I became involved in campaigning for better cycle facilities in London, as a member of the Camden Cycling Campaign (part of the London Cycling Campaign). We made some significant gains, especially with the opening of the immensely successful cycle tracks in Camden and Bloomsbury in the late 1990s and early 2000s. After those initial successes the pace of progress dropped for a number of reasons and the position of cycling in London, despite increasing numbers of people cycling on the city’s streets, continued to suffer from official incompetence, indifference and often outright hostility. However, the growth in the number of people wanting to cycle has countered the official approach and an active and effective campaign is being waged in London in particular by a range of groups and individuals. The question of cycling is now firmly on the agenda with all sorts of major businesses and employers giving their backing to proposals to start developing a cycle network in London. I thought it might be useful for those campaigning today to see what we did in Camden 15 years ago to get some proper consideration of cycling as a serious option for travel in London. We persuaded Camden Council at that time to share our vision that high-quality cycle networks were essential to attractive more cycling in London. The Camden and Bloomsbury tracks are now among the capital’s most heavily used cycle routes and generate great support from cyclists. 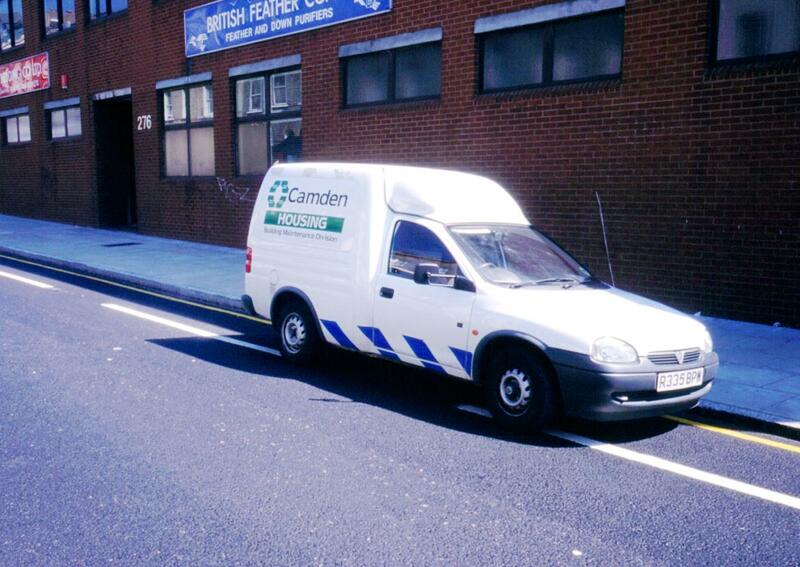 Camden Council has continued to hold onto the vision and has extended the original network links and at the time of writing this blog it is consulting about northern extension of the Camden (Royal College Street) route. 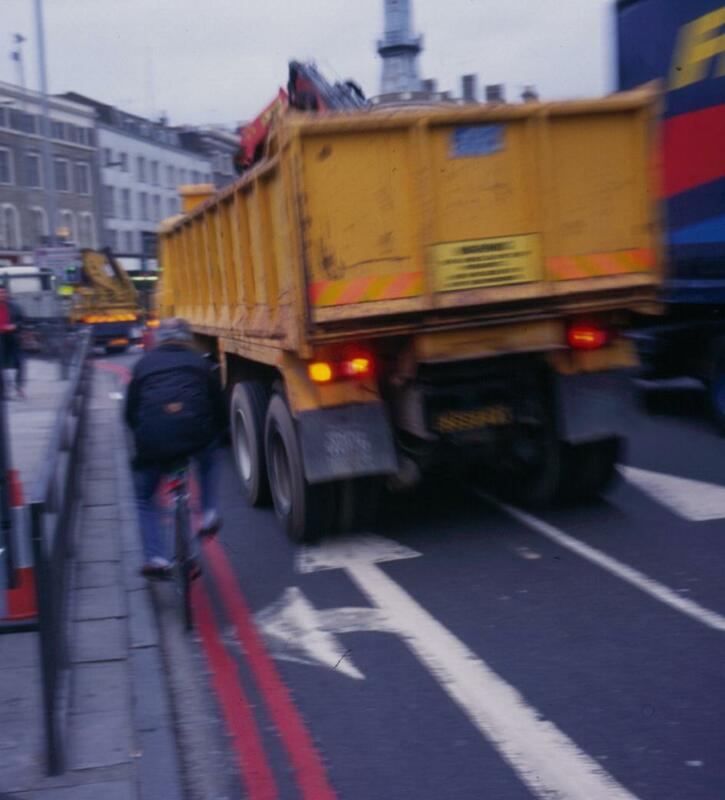 This posting is intended to explain the context at the time and aims to illustrate how we argued for the Camden cycle tracks and how we won support from cyclists, councillors and the public. The posting is developed from a slide show presentation I made to Camden council (and many other organizations) from 1998 to the early years of the new century. The passage of time and the different technologies now in use, make it impossible to recreate exactly the presentation (which was in any case adapted for different audiences). I have also updated some sections to explain what happened after the initial implementations. In the mid-1980s I spent three years living in the Hague and then, in the early 1990s, another three years in Brussels. For someone used to cycling in Britain, the cycle networks provided all over Holland and in some places Belgium were a revelation. 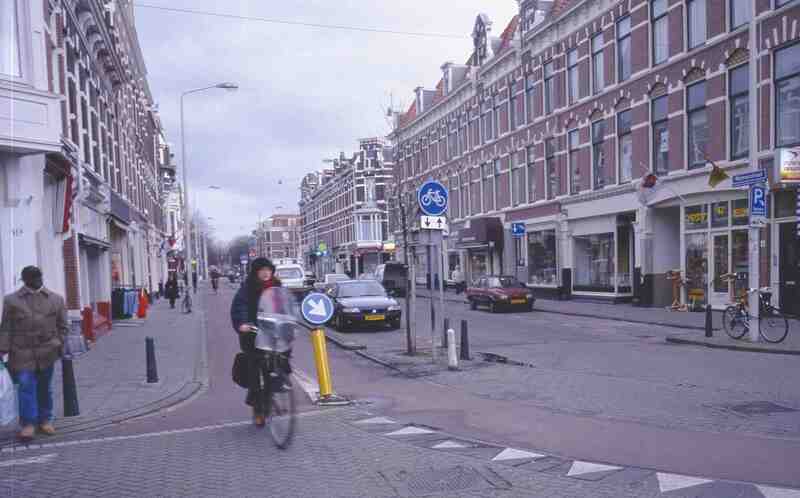 The greatest turn off about urban cycling – sharing road space with speeding motor vehicles – was minimised. You could cycle into a city to work, to shop or for leisure in the evenings without having to place your life in someone else’s hands every few seconds. Cycling was natural and nearly everyone did it. 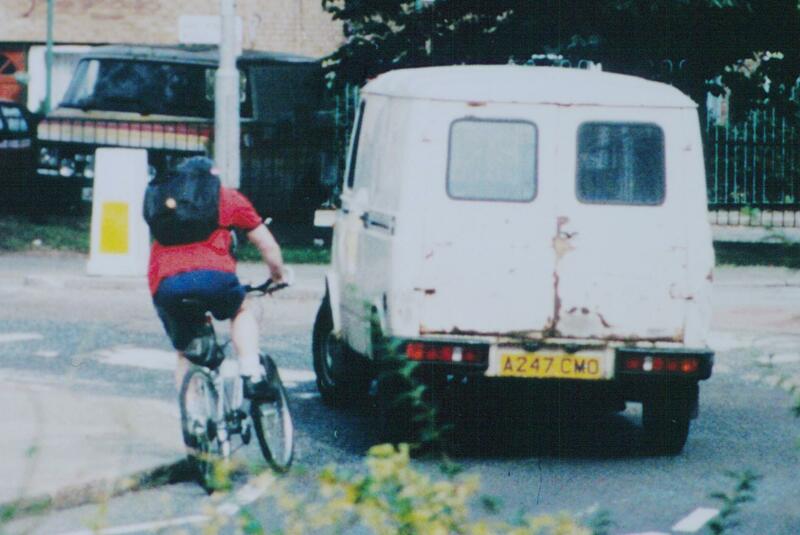 When I returned to London in the mid-1990s | had completely forgotten what it was like to cycle in Britain. The pleasure to be found in cycling was ripped away. Instead it became a hassle – and all too often a very frightening hassle. This is such a great a shame because London is potentially a superb place for cycling. And cycling is a mode of transport which could answer many of the city’s needs. Yet cycling was paid only lip service. 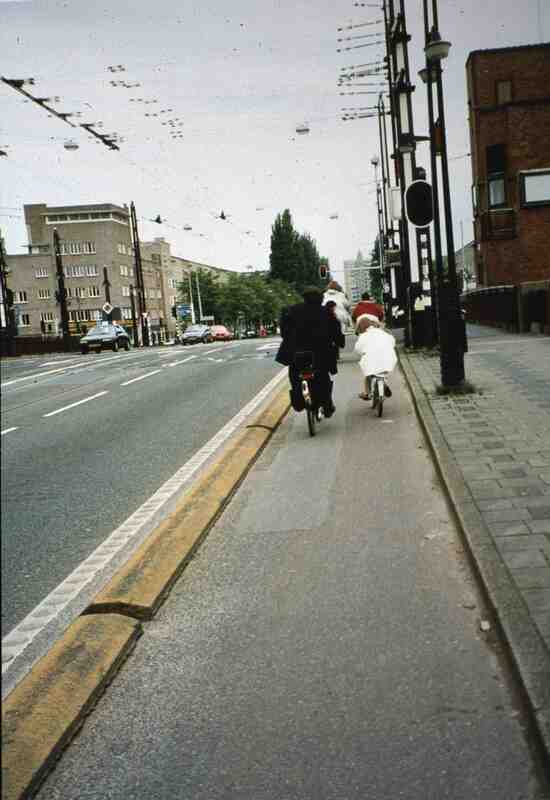 Cycle facilities were dire – always useless and often dangerous. As I cycled about in London I tried to see how Dutch and other continental cycle engineers would provide cycling facilities by better use of road space. Cycling up and down my local cycle route between my home in Kentish Town and central London I began to draw some firm ideas for improvements. The London Borough of Camden is a narrow slice of densely populated ‘Inner London’ joined, along the Euston Road, to a chunk of ‘Central London’ housing the University College of London, British Museum, British Library, and major railway stations: Kings Cross, St. Pancras and Euston. ‘Bloomsbury’ is rather inaccurately used as a name for the area south of the Euston Road – properly it applies only to the western area, however, it makes a convenient name for an area that lacks a single label and that is how I have used it in this posting. 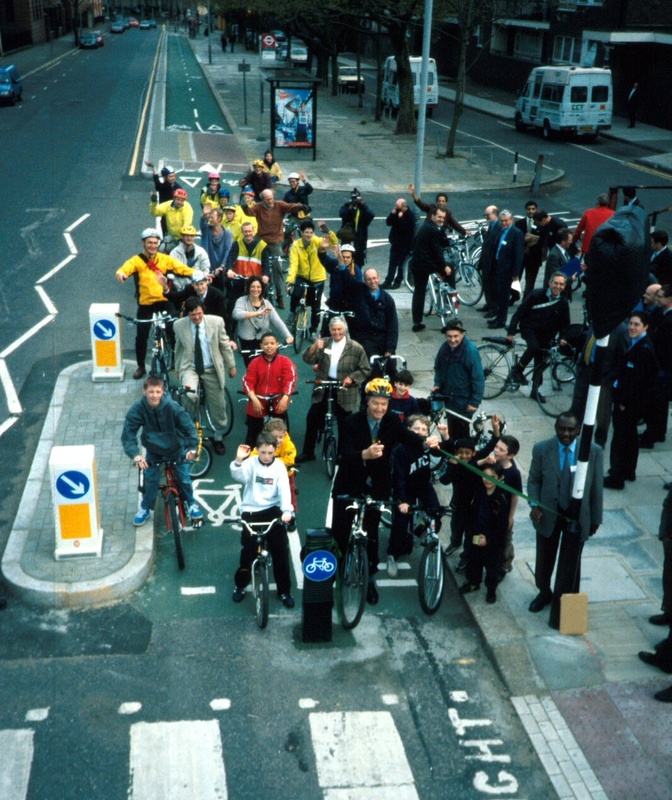 In the early 1990s Central Government – which had abolished the Greater London Council in 1986 and directly managed London’s traffic and transport – backed the introduction of a ‘London Cycle Network’. However, implementation was the responsibility of local boroughs. An anti-cycling borough such as neighbouring Westminster could get away with doing little or nothing. A somewhat more open council, such as Camden, was willing to attempt to introduce some cycle facilities, but it lacked engineering and planning skills, as well as real political commitment from the ruling party’s senior councillors, needed to do a proper job. 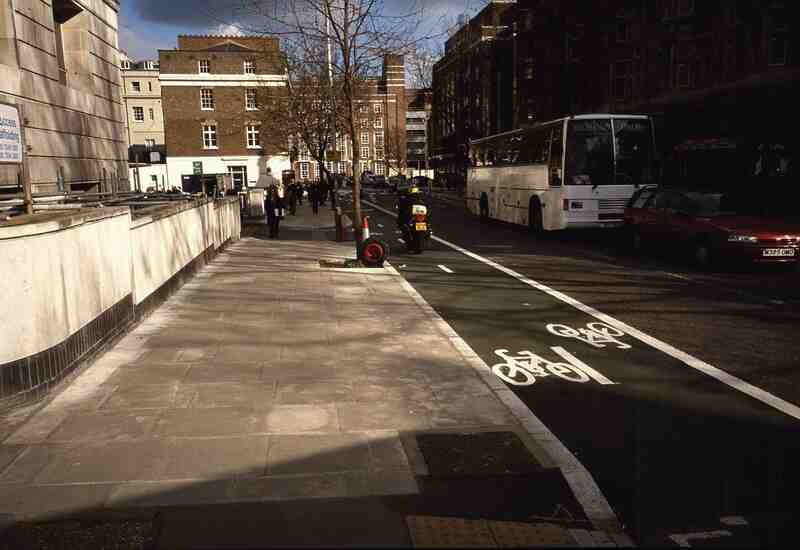 The London Cycle Network route introduced in Bloomsbury (running East-West across the borough) was implemented with painted green cycle lanes – and they were only ‘operational’ during rush hours (that is, for just over 10% of the time). And, anyway, painted lanes did nothing to stop the parking, loading/unloading, taxi pick-up/set-down and other kerb-side activities which made the lanes useless even in the rush hours. The lanes served as a totem for local and central government politicians who wanted to point to something they were doing to stimulate cycling, but without upsetting the motor vehicle lobby. In fact, the painted lanes made no difference at all in reality. 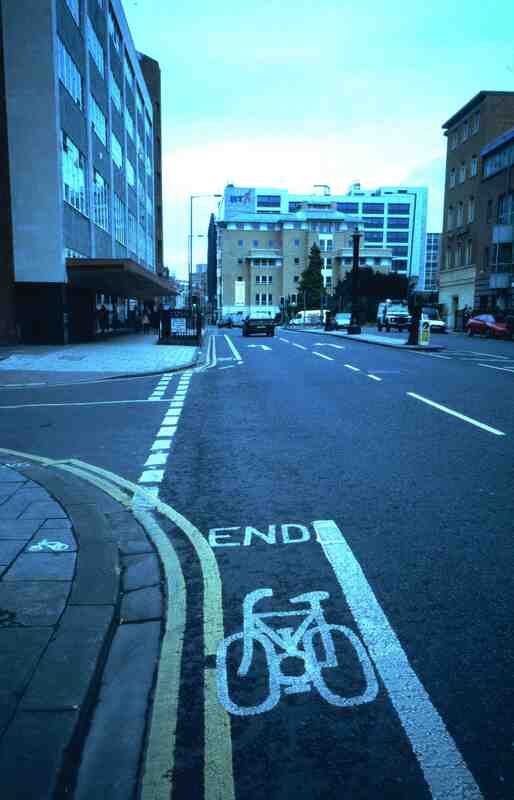 The painted lane routes in Bloomsbury were treated with derision by cyclists and there was an intense desire for effective solutions to the hazards of cycling in London. The London Cycle Network also envisaged a North-South route through the borough of Camden. In part such a route already existed. Known as the ‘Somers Town route’ it had been introduced in the early 1980s by the Greater London Council. It followed a fairly direct route via back streets, from Kentish Town, via Camden Town and Somers Town, to cross the Euston Road and then link in with the Bloomsbury London Cycle Network route. Some small parts of this North-South route were quite reasonable, though its overall design was pretty shoddy. 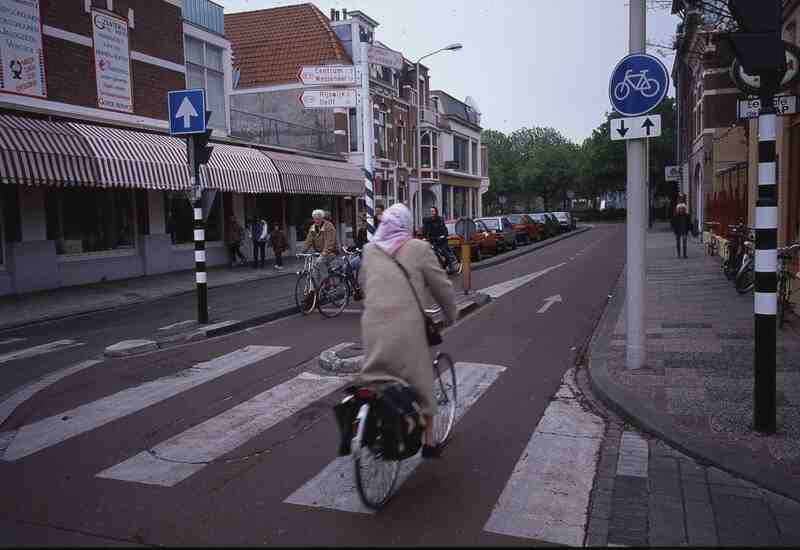 All the same, it was fairly popular with cyclists given the horrifying main road alternatives. Nearly all those alternative routes through the borough of Camden had been incorporated in the 1960s into a ‘gyratory’ or network of one-way roads designed to encourage high speed motor driving. Cycling on such roads was dangerous and extremely unpleasant (and still is). This was also true of the Euston Road, which separates Inner London Camden from Central London Camden but which remained two-way. The Bloomsbury route ran parallel to the Euston Road on its southern side. 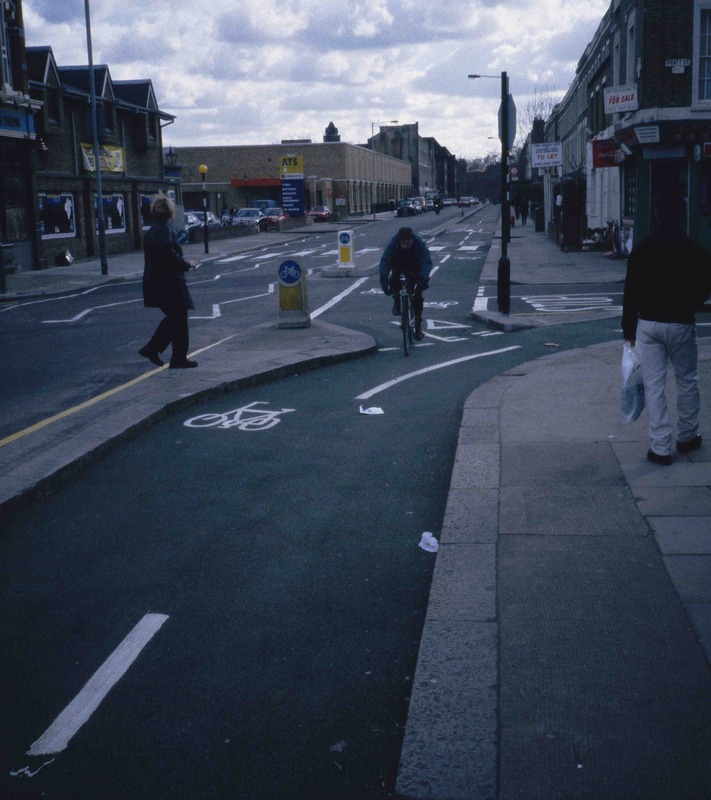 One of the factors that propelled me to get involved was that Camden Council initially planned for part of the London Cycle Network to run along my road in Kentish Town, linking directly to the Somers Town route. However, one year before that was due to happen the council removed parking restrictions on the both sides of the road, thus removing any possibility of its use as a cycle route. Whether this was deliberate sabotage or simple bungling, it was typical even of a supposedly supportive council such as Camden – and made me determined to contribute to changing things. The most compelling argument for the lack of attraction of cycling in London is the state of overcrowding on the public transport, especially the tube. 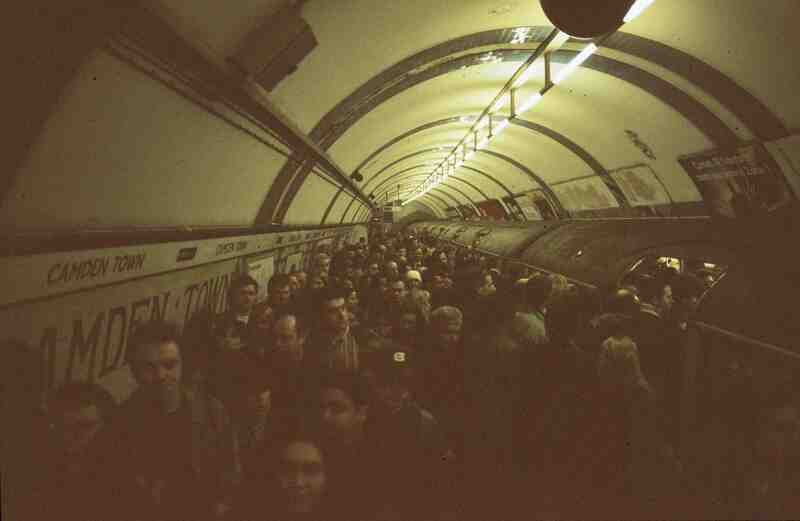 Quite often it is impossible during the rush hour to get on to a tube train at a station such as Kentish Town as train after train would be already be packed full of passengers. Surely no more unpleasant form of travel could be contemplated than being tightly compressed into in ageing trains running on a crumbling infrastructure. Nothing could be worse – except cycling on London’s streets given that many thousands times more people chose the tube over the bike. The deliberate policy of successive post-war British governments to ignore cycling in road design was intended to hasten its decline. In that it was highly successful. Cycling levels fell continuously, whereas in continental Europe, where different policies were implemented, the numbers of people cycling have increased since the mid-1970s. Here, then is the core of the argument. 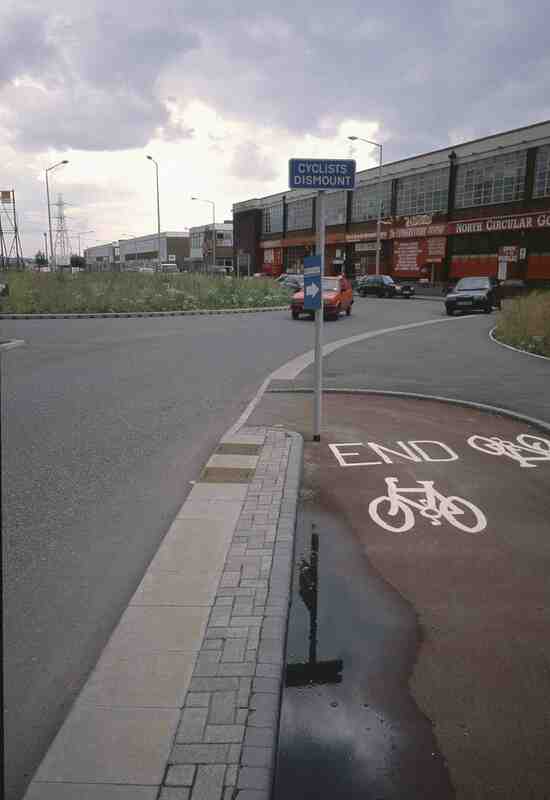 British street design discourages cycling. Continental street design encourages it. 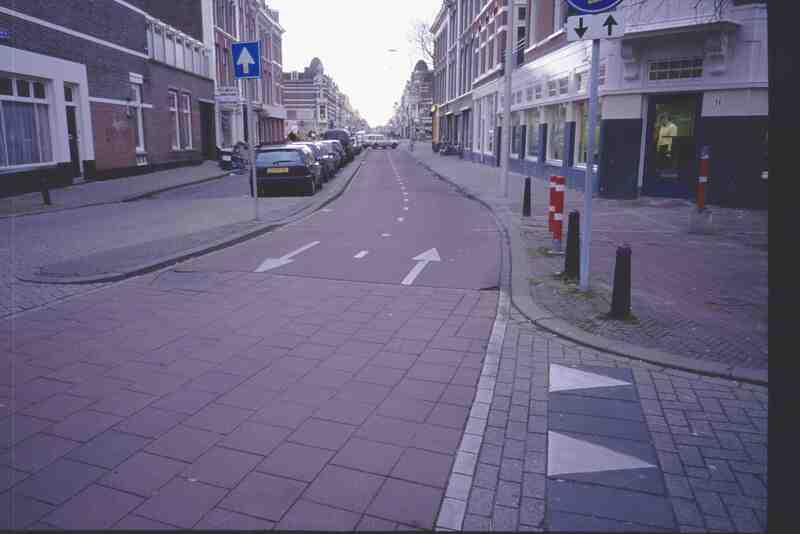 British traffic engineers and politicians often argue that Britain’s city streets are too narrow to allow for cycle provision, but continental practice shows this is not true, rather it is an excuse for carrying on wasting road space in order to speed up motor vehicle traffic to give the illusion of improvement. 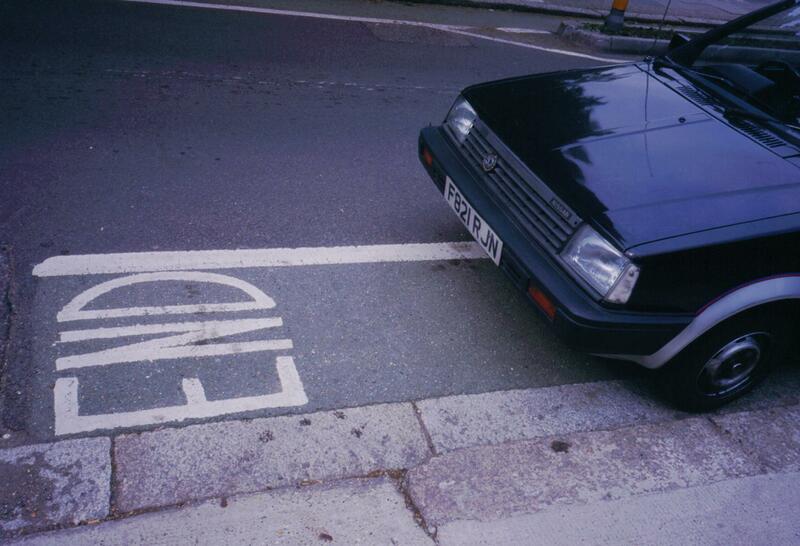 In the early 1990s the Government was securely bound to a ‘Great Motor Economy’. But by the middle years of that decade, even Conservative ministers were beginning to wonder whether cycling deserved some attention in policy. This was the period of the great environmental protests against the Government’s programme of road building. Opposition parties took up the argument, offering support for ‘green transport technologies’. 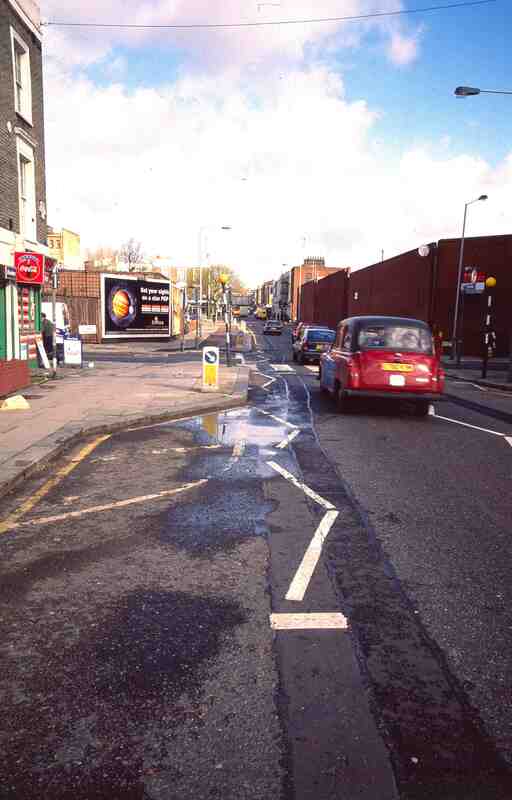 The ‘London Cycle Network’, using painted cycle lanes and small scale ‘permeability’ measures, was the result. Surprisingly, the painted lanes in Bloomsbury were actually much better than many of the London Cycle Network ‘facilities’ put in by other London boroughs. 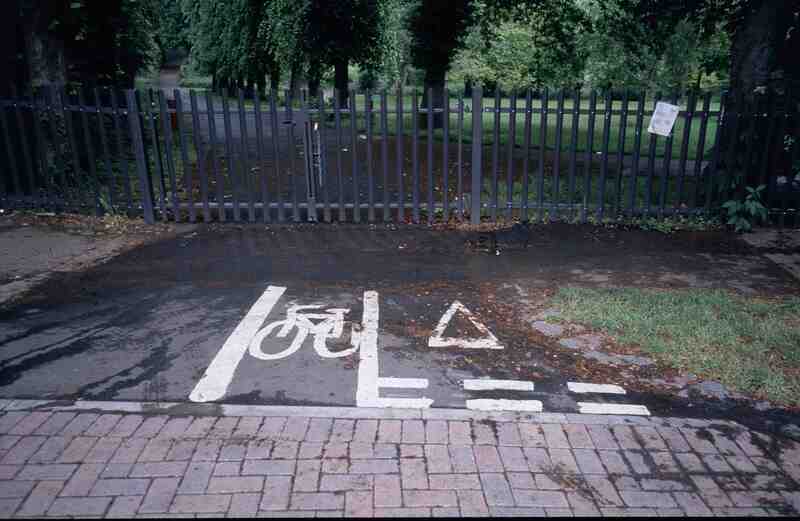 The amateur quality of cycle facilities in Britain generally has a number of causes. Putting up a few signs is easy. Council officials and elected representatives alike make it appear that they are doing something, without generating opposition. Residents, motorists and the immensely influential black cab lobby are unlikely to get upset by a few signs and bits of paint – as long as the signs and paint can be ignored with impunity and nothing actually changed in the deadly power relationships played out on the roads. For several decades there has been a culture of not providing cycle facilities within the British road planning and engineering professions. This is not surprising. In a country which has no funds or policies for cycle facilities, the professions will not bother to train engineers and planners. As a result generations of British traffic engineers and planners are, at best, ignorant of cycling needs or, at worst, hostile to cycling. This has led directly to the dire quality of virtually all cycling facilities that have been introduced in recent years in Britain. 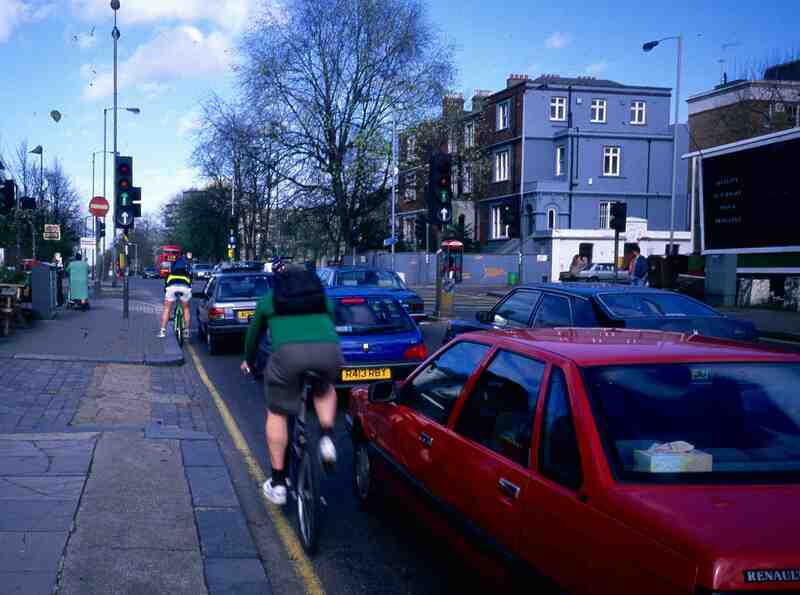 Why is cycling so unpopular in Britain? Why is cycling limited to few people in Britain, while considerably more people cycle in countries just across the Channel? Getting the right answer to this question is critical if cycling is to become more popular in Britain. Cycling offers many advantages – it’s healthy, creates minimal pollution, is very cheap and in Inner and Central London is by far the quickest way to travel. The reason cited by most people for not taking up cycling is the ‘danger’. The same reason is cited by cyclists who decide to give up cycling, despite otherwise enjoying its clear benefits. This is reflected in the way that the British cycling ‘population’ is heavily biased towards ‘yams’ (young adult males) who are more willing (sometimes eager) to take risks which most people reject. This severe age and gender imbalance in the cycling population can be seen in the photos in this posting, where nearly all the cyclists in photos from British streets are ‘yams’, while those in the photos from continental Europe show all ages and genders. This anecdotal evidence is backed up by reliable figures from the OECD as shown in the graphs below. The evidence from the continent is absolutely clear – where there is widespread provision of high-quality cycle networks, there are also high levels of cycling. And, crucially, the cycling ‘population’ is balanced, with roughly equal numbers of women and men cyclists and a much better age profile with more younger and older cyclists. The major challenge of increasing cycling among the general population demands that this issue is tackled and the only way that will happen is by providing safe, high-quality cycling networks that can attract new cyclists. This means that main (or ‘backbone’) cycle networks need to be given physical protection from encroachment (‘segregated’ or ‘dedicated’ or ‘protected’ cycle tracks). But it is also essential that such network links are continuous, tackling all danger spots. 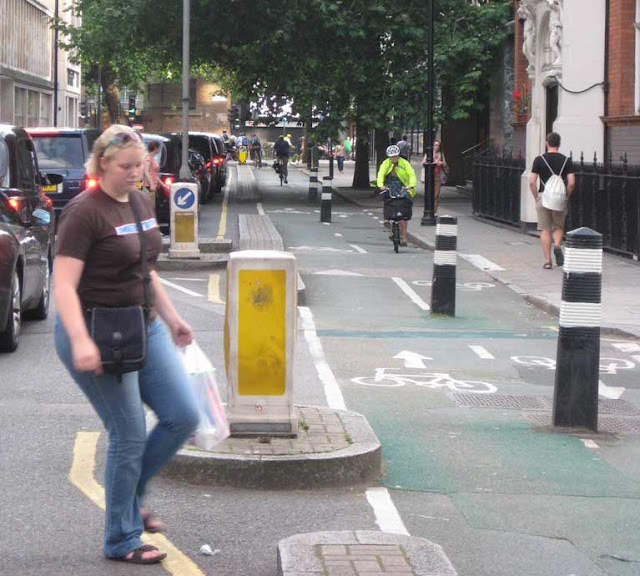 This is, of course, the reverse of what usually happens in Britain, where cycle facilities are short, discontinuous and all too often disappear in difficult situations, such as major junctions. The OECD is the Organisation for Economic Cooperation and Development; one of its major tasks is to publish statistics which offer reliable international comparisons. 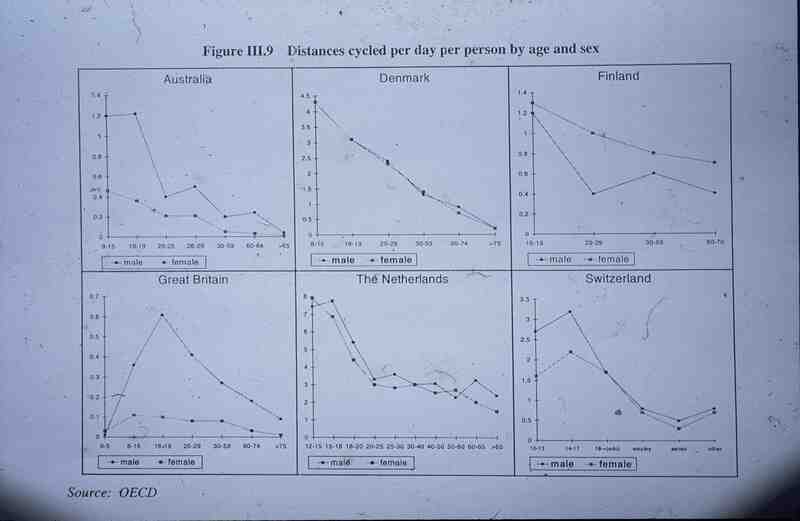 These graphs shows that In Britain and Australia cycling is dominated by young adult males, while in countries such as the Netherlands, Switzerland, Denmark and Finland there is a balance of genders and many more younger and older cyclists. These graphs show how cycling infrastructure determines the number of cyclists and their age/gender profile. Note that the graphs are adjusted for the level of cycling numbers in each country (left hand scale) – if this were not done the Great Britain graph would be unreadably tiny. These dangerous cycling conditions are reflected in the cycling injury statistics. The Times recently (March 2012) reported “the latest published statistics show that overall cycle casualty rates rose in 2008, 2009 and 2010. The number of casualties also rose in each of those three years from 859 in 2007 to 960 in 2008, 1,073 in 2009 and 1,255 in 2010 on the TfL (Transport for London) network. The number of cyclists killed or seriously injured (KSI) fell from 147 in 2007 to 133 in 2008 but then rose to 136 in 2009 and 150 in 2010. The KSI rate measured as a proportion of journeys taken by bicycle has fallen in each year since 2007. In many continental European countries high-quality cycle networks have been provided by local, regional and central governments with the express aim of making cycling more attractive, thus boosting cycling levels. This has been carried out most systematically in the Netherlands, but other countries, including France, Germany, Italy, Spain, Denmark, Norway, Sweden, Switzerland, Finland and Poland, have also introduced high-quality cycling facilities. One of the objections to cycle networks that comes from British traffic engineers is that British city streets are not suitable. But this is a fallacy – or perhaps more accurately it is an excuse. 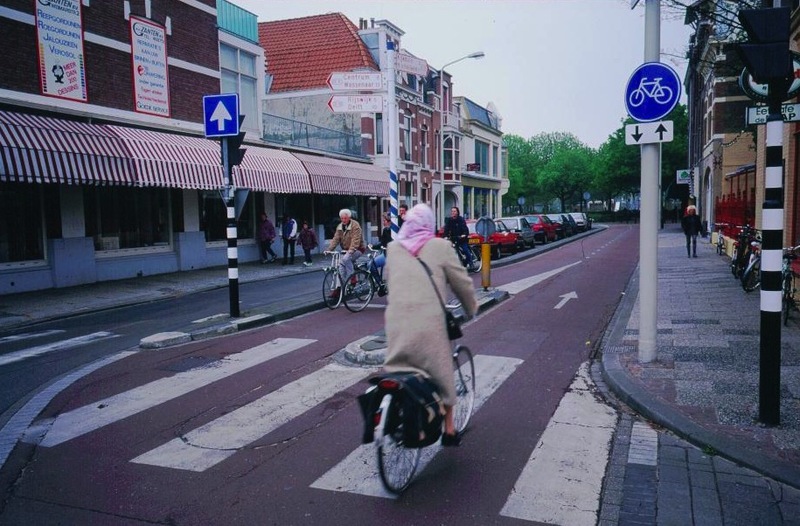 There are many examples of the implementation of cycle routes in inner cities in many continental European countries. 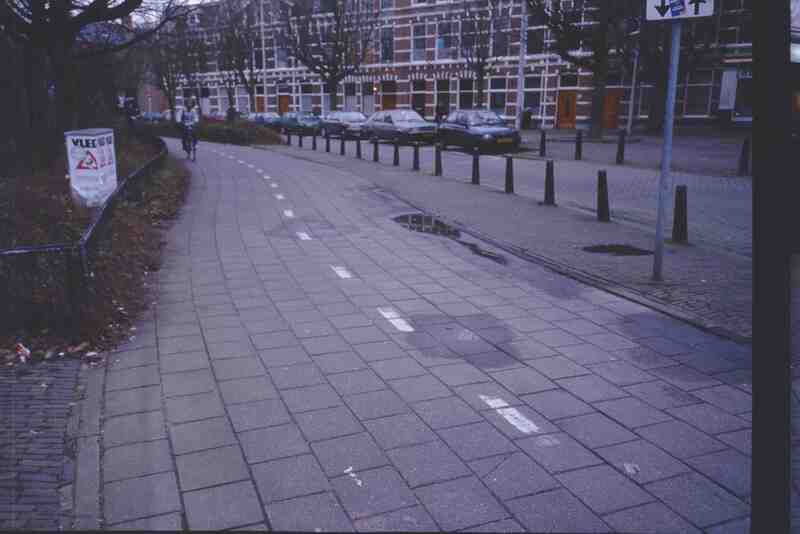 In several places segregated cycle tracks have been introduced by reallocating space for the dedicated use of cyclists. This technique is suitable for dense, inner city use. The inner-city environment is not dissimilar to many streets in British cities and towns. The key is the effective use of road space and the balancing of demands of motor vehicle users and others. Two-way tracks are not always an ideal solution, and careful attention must be paid to design and implementation, especially of junctions. There can be dangers at ‘uncontrolled’ junctions for cyclists going the ‘wrong way’, but this is corrected by the use of traffic lights at junctions with heavy motor traffic. 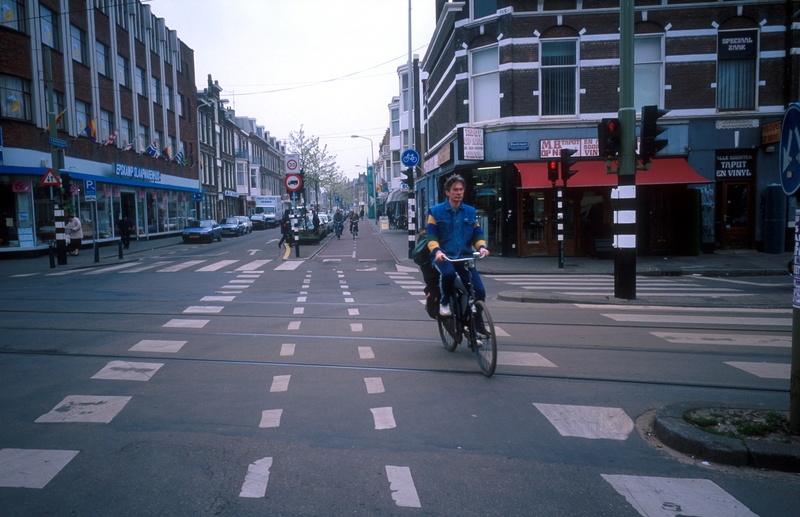 The photos on this page show the variety and the continuity of one route in the Hague. 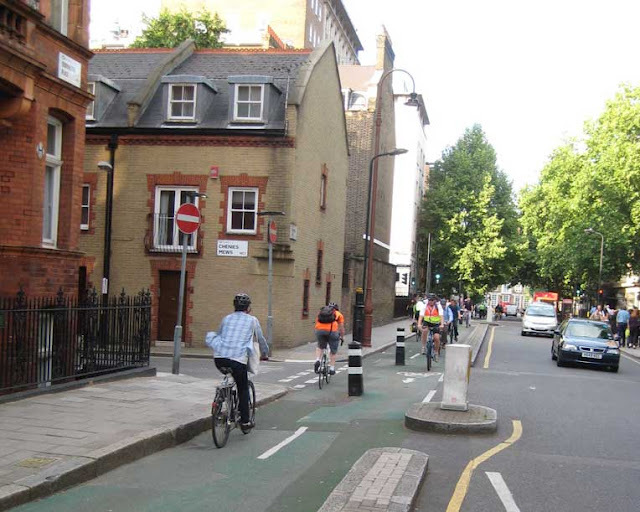 Another objection, raised for example by the anti-cycling Westminster borough council, is the claim that cycle tracks separated with kerbs prevent deliveries and servicing of addresses alongside the track – as the first photo below shows this is nonsense. In 1997 the Conservative Party was replaced as the party of Government by the Labour Party. Environmental concerns played only a small part in the shift of public mood, but the Labour Party (and other opposition parties such as the Liberal Democrats and Greens) had played up the environment as an issue in their campaigning. ‘Things could only get better’ was the theme of the new government. Its promise to introduce a Green Transport Strategy was central to its programme, we were told. 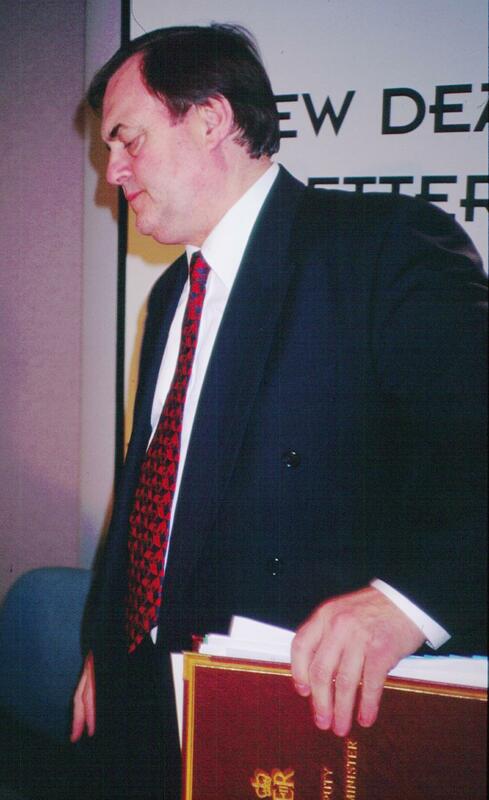 John Prescott – the deputy prime minister no less – was put in charge of developing the Strategy and he certainly talked the talk about a great shift in priorities. This talk influenced the Labour Party in Camden, which controlled the borough council. A newly elected councillor, Gerry Harrison, was appointed as chairman of the council’s Streets Committee and he took seriously the new Government’s publicly vaunted commitment to cycling. He set up a liaison committee for cyclists and pedestrians to be able to put their points of view to the council to counter the dominance of the motor lobby over the council. Thus, when we as Camden Cycling Campaign took our proposals to the council, we found a sympathetic hearing from within the council and from others. The political backing given by Gerry Harrison and a number of other pro-cycling councillors was the critical factor in the success of our campaign. Unfortunately, the sentiment of the Government soon changed and this was reflected in the local Labour Party. Prescott’s much vaunted Green Paper on the Green Transport Strategy was a complete flop. This was obvious at its launch, when it became apparent that the Green Paper itself was only a ‘framework’ and that there would be a series of individual papers on different parts of the transport system. This was bureaucratic code for Prescott having lost the battle within government. It was back to the traditional policy of not attempting any serious change on Britain’s roads. The changed mood affected the Labour Party in Camden. Also, Gerry Harrison lost his influence within the local party when he resisted Government plans to minimise the role of committees in local councils, replacing them with ‘Cabinets’. The Streets committee was subsumed into Environment, with one less than fully sympathetic Cabinet member now taking decisions on his own and on a much wider range of subjects. However, the consultative committee survived and by that time sufficient work had been done on the first phases of the cycle tracks for them to go ahead and, despite all sorts of obstacles, the basic track proposals were implemented in the short ‘window of opportunity’ when people believed that things could indeed be made a bit better. Some of the difficulties that were encountered will be detailed in the ‘Support and resistance’ section of the next posting which will also look in more detail at the Royal College Street and Bloomsbury cycle tracks and the latest developments.